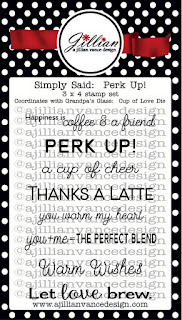 A Jillian Vance Design: A Monday Perk Up for the Fall Coffee Lovers Blog Hop! 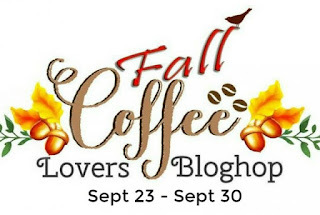 A Monday Perk Up for the Fall Coffee Lovers Blog Hop! Start HERE. There are lots and lots of great prizes that are being given away! 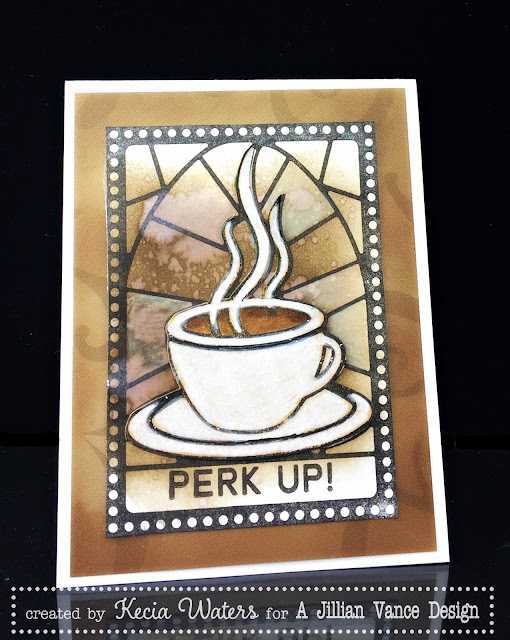 Kecia Waters on the AJVD blog today, sharing a card I made with AJVD's Cup of Love and Perk Up! stamp sets. This card is the result of reactivating Distress Ink with a water spritzer. On a piece of white cardstock, I sponged some Distress Ink Walnut Stain rather randomly. I then lightly spritzed some water onto the cardstock. What appeared looked like coffee that had spilled. 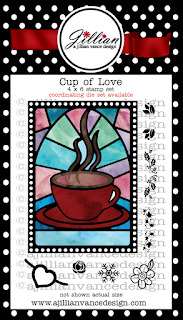 So, I grabbed my Cup of Love stamp set and inked it with Versafine Onyx Black. I stamped directly onto my "spilled coffee look" and cut around the image. I colored some portions of the stained glass with a beige Prismacolor pencil. I once again added Versafine Onyx Black ink to the stamp from Cup of Love, this time stamping it onto a piece of kraft cardstock. I colored the cup, saucer, and steam portion of the image with a white Prismacolor pencil. I then fussy cut around that portion of the image and adhered it on top of the first stamped image. I really liked the pop of white against the look of spilled coffee. The sentiment from the Perk Up! stamp set was stamped directly onto the image with Versafine Onyx Black. The image was then placed on a panel of patterned paper from Lasting Impressions. Please join us in this fun hop! We can't wait to see what you create! So beautiful card. Love these colors! I love the colors you chose for this. Really gorgeous. This card is beautiful! The warm color tones are cozy! This is gorgeous and another wonderful way of using this stamp image. I love the colors and background you created for it. Oh my...this is gorgeous! Love the stamp sets and colors are beautiful! Oh my gosh. I must have that stamp. The card too. I must have the card! Great job! Gorgeous!! LOVE the inking... that background is yummy! very cool card, love the color! Oh love this. The inky goodness is perfect! Kecia, I love the card! The spilled coffee background is great. Sylvia D.